Let us travel through this Lenten Season remembering to reject negativity and limiting thoughts. We have bought into the superstition that goodness is a soap bubble about to burst. But I would like for you to know that goodness is successive, a base of beginning. We spend a lot of time listening to our “realistic” voice. We always want to wait and see how things turn out. Perhaps we should bring our celebration totem because in that moment we will know a fuller truth. The following disappointment does not change the reality of that original holy moment until you let it. The wait and see was an admission that the future could change the current experience and the character of our infinitely Loving God. It’s considered prudent to prepare for rainy days. But we don’t do much to prepare for joy. Instead, when love or abundance comes to our house we think it’s a fleeting visitor, a lost butterfly, or a hoax. But I challenge you to consider that when you are in your joy you are in your sane mind. I do not advocate you deny reality, just claim it. You were designed to blossom. I urge you to try on a new sense of realism. When good things happen to you do not wait for the other shoe to drop. Expect something even better now. I would predict the shoe on the ground is about to fly. 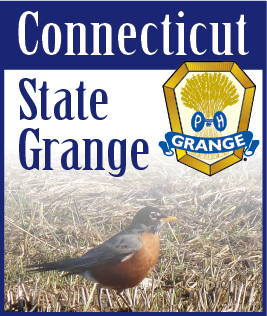 I would remind you to save the date of June 12th at 11:00 A.M. in Cheshire for State Grange Sunday Services. See you there and have a blessed Easter Season.